(This story appeared as a Blast from the Past column in Goal Weekly on 2 March 2012, p. 19. Click on the photographs below to enlarge them. The headline picture is of Jim Fraser (left) and Lou Kastner, two superb keepers. It is by Roy Hay, the next two in the column are from the Laurie Schwab collection at Deakin University Library). Australia has had some wonderful goalkeepers over the years from George Cartwright and Jimmy McNabb who began the tradition in the 1920s and 1930s to Mark Schwarzer who holds the Socceroo position today. It is arguable that over his long career that Jim Fraser has had as much influence on the game as any of them. He helped Australia qualify for the World Cup for the first time in 1974, played at the top level for Budapest St George in its glory days in the 1970s and in recent years has coached many of the top keepers in the land at his International Goalkeepers’ Academy in Sydney. He has also been the specialist goalkeeping coach at Sydney FC in the A-League. His enthusiasm and professionalism have communicated themselves to a legion of young and not so young keepers including Clint Bolton at Melbourne Heart and Liam Reddy at Sydney FC. Born in 1948 in Sydney, his dad was an ice hockey goaltender, but young Jim made his game football. He started at Polonia and his talent was recognised early as he was selected as a member of the Australian World Cup squad for the qualifiers in 1969, behind the incumbent Ron Corry. Fraser went to St George in 1970 where he broke his wrist in 1971 and spent some time at Canterbury on loan after he recovered. St George tried a couple of other keepers but when Jack Reilly decided to return to Melbourne, Jimmy Fraser regained his spot at St George. 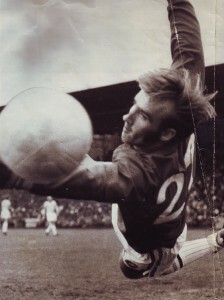 When World Cup qualification got under way in 1973, Ron Corry was still the number one keeper with Reilly pressing him close. Jim Fraser’s performances for St George could not be ignored and he got his first full cap at Olympic Park in Melbourne against Bulgaria on 18 February 1973. Though the Socceroos lost two-nil against what was their World Cup team, Fraser showed that he could handle the job. 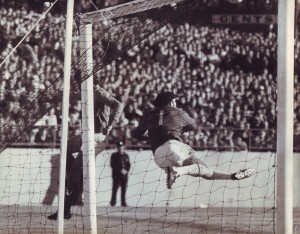 Jim Fraser makes a finger-tip save against Iraq in 1973. 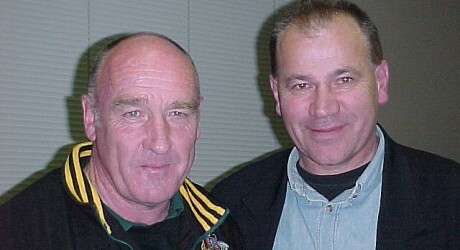 After Australia was held to a surprise three-all draw by New Zealand, Fraser was given the number one spot against Iraq on 18 March. He kept a clean sheet as the Socceroos held out Iraq in scoreless draw. A six-nil thrashing of Indonesia saw Australian through the first stage, a point and goal difference ahead of Iraq. The next opponent was Iran and Fraser once again denied the opposition as Australia ran away with a three-nil win. The second leg in Tehran was a different story as Iran scored twice through Parviz Ghelichkhani in just over half an hour. It was backs to the wall from then on, with Fraser putting up the shutters once again. Jim Fraser and another flying save against Iran in 1973. Then came home and away matches against South Korea. Both were drawn, the first scoreless, the second a fightback from a two-nil deficit. While Branko Buljevic and Ray Baartz got the credit for the goals, Fraser’s patience, skill and positioning ensured no further goals against and so the final place at the World cup had to be decided by a third match in Hong Kong. 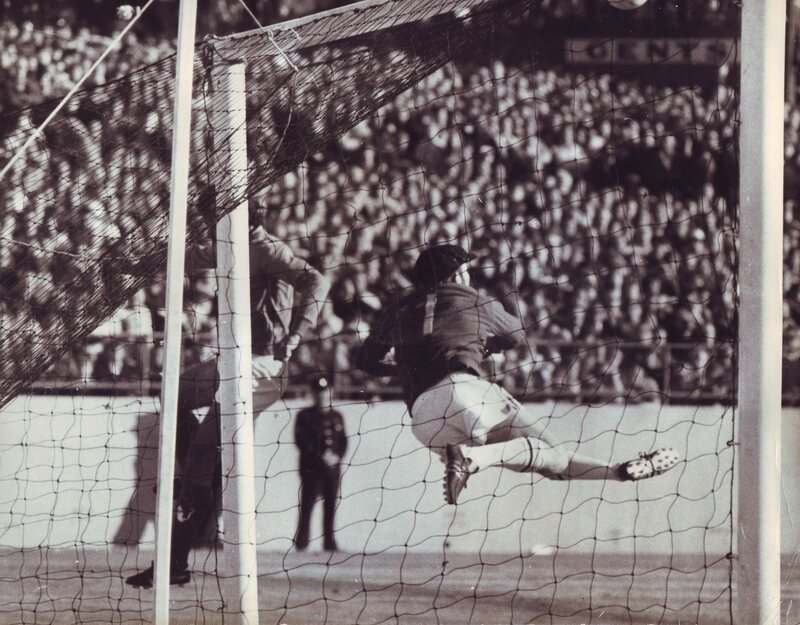 Everyone knows about Jimmy Mackay’s 70th minute thunderbolt, but fewer appreciate the unflappable keeper’s performance. Les Murray thought it was the best goalkeeping performance he had ever seen. So Australia was all set for the trip of a lifetime to West Germany. Unfortunately Jimmy Fraser found he could not abandon his security dog business and had to pull out of the squad, handing his place back to Jack Reilly. Virtually all of the Australians were part-timers in 1974 and Manfred Schaefer who ran a milk delivery service had missed one tour and threatened to leave another after his financial arrangements were not honoured by the Australian Soccer Federation. 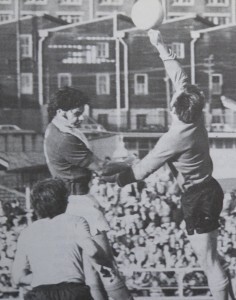 Not the tallest of keepers, Jimmy Fraser punches clear in a match in Sydney. Source: Sid Grant, Jack Pollard’s Soccer Records, p. 268. Jimmy Fraser amassed 10 caps for Australia, and represented New South Wales against several visiting teams and in interstate matches. When he hung up his boots in 1978 he began a long-running coaching career at a host of clubs and with the national and state teams and eventually set up the International Goalkeepers’ Academy in 2000 with the aid of a number of investors and supporters including that well known soccer nut, would-be keeper and film superstar Anthony La Paglia. Pierre Littbarski who coached Sydney FC to the A-League premiership in 2006 is a great fan. The last words on Jimmy Fraser should rest with him. ‘The work you did with the goalkeepers was outstanding. Clint Bolton became a real consistent player and real personality. With your help he developed his physical skills a lot, but more important for me was, that he went from a “one man show” to a real leader. This was especially in the final series a big factor and gave us the championship, because Clint Bolton played very good. Our second keeper Justin Pasfield improved his basic skills a lot in one season. Also your work with the young keepers, who joined us regularly in our sessions with Sydney FC, was very effective. That proves, that you can coach players of all ages.